When she was in her late sixties, Célestine Eustis wrote a cookbook: Cooking In Old Créole Days (1904). Miss Eustis came from a prominent New Orleans family…Her father helped found a railroad and Tulane University. Before the Civil War, one of her brothers served in the U.S. Congress and then became a Confederate diplomat to Paris. He and his wife, Louise Corcoran Eustis (whose father founded the Corcoran Gallery in Washington D.C.), continued living there as expats after the war and Celestine Eustis appears to have spent a good deal of her time with them in Paris and at their Cannes villa. Another brother was U.S. Ambassador to France under Grover Cleveland. These random bits of Miss Eustis’ family history are suggestive of what sort of recipes and what sort of ‘Old Créole Days’ Miss Eustis remembered. Her book evokes a spirit of open-handed hospitality. Here are homes that set about ‘setting a good table’ with a will…and with substantial means to do it. The hostess presiding over one of these good tables was not doing much, if any, of the actual cooking. 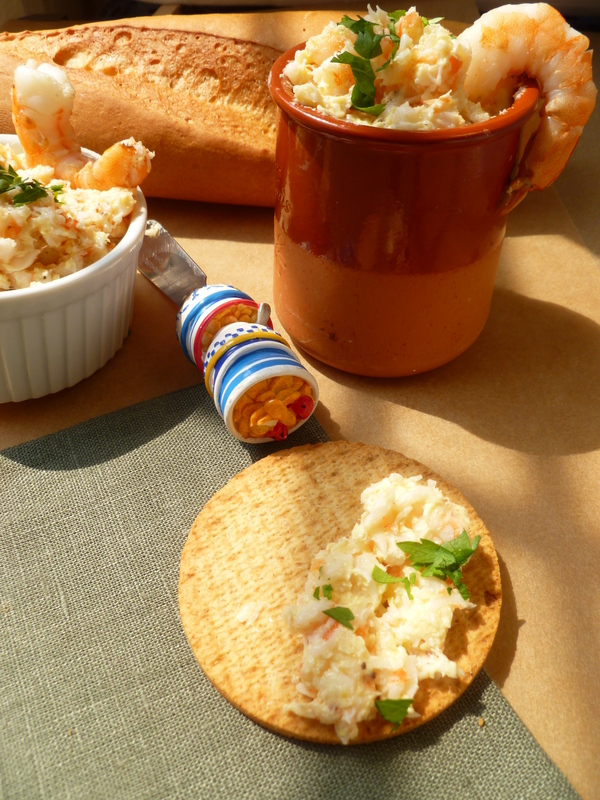 Many of the recipes in Old Créole Days come from the cooks who served with these families–including Mme. Josephine Nicaud who worked for Ambassador Eustis’ family for over 40 years. 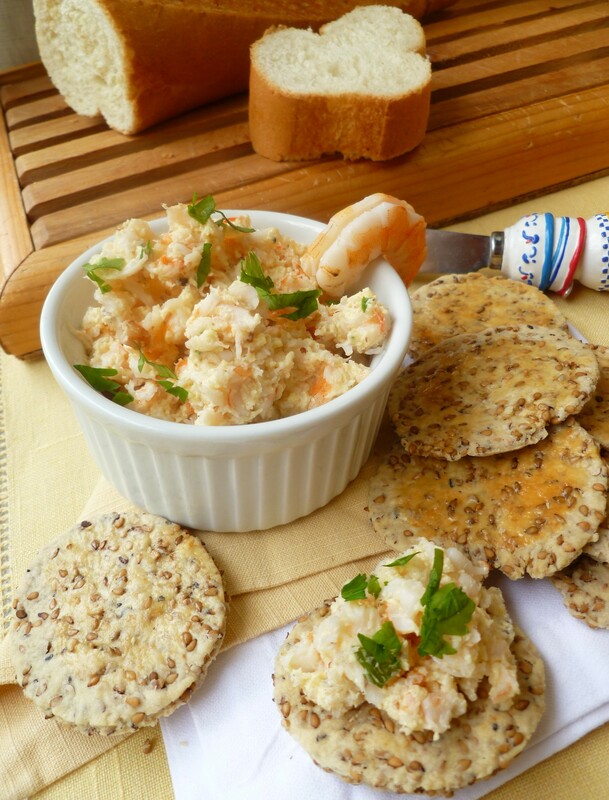 This recipe for Shrimp Pâté with Gin follows Miss Eustis’ good advice and doesn’t overburden the primary ingredient with spice and liquor. 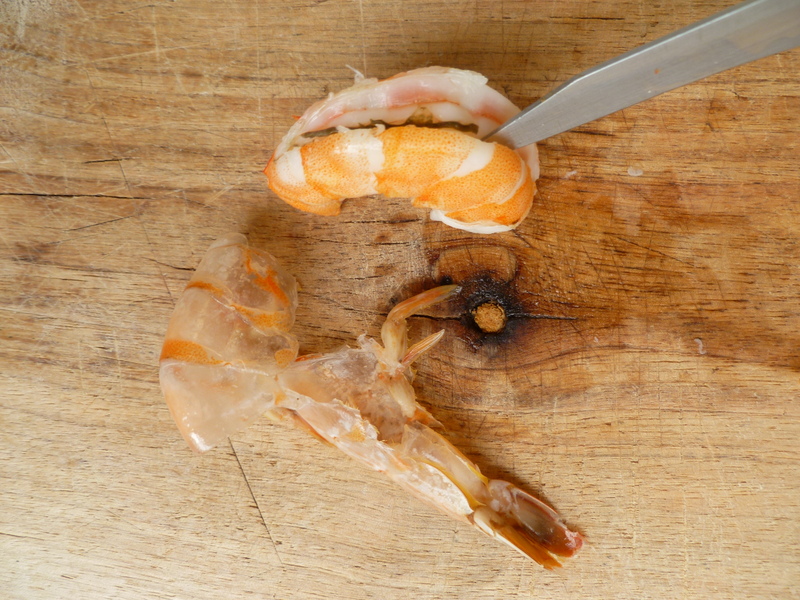 The shrimp are only partially ground and lightly bound together with butter holding traces of juniper (from the gin) and spices. 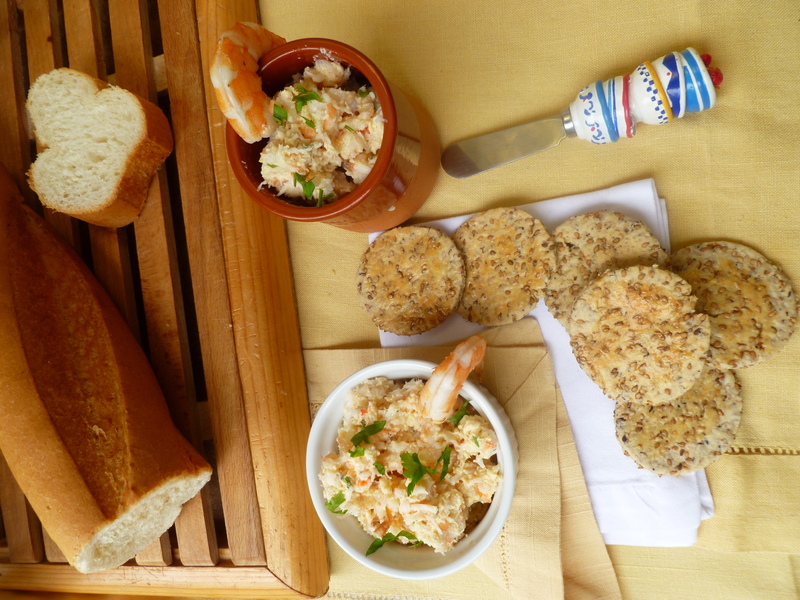 The finished coarse-textured pâté tastes primarily of fresh shrimp. small Ramekins or Crocks: The number depends on their size–but for this amount of pâté, a couple of small ones will probably be enough. When they are cool enough to touch, peel and clean them. 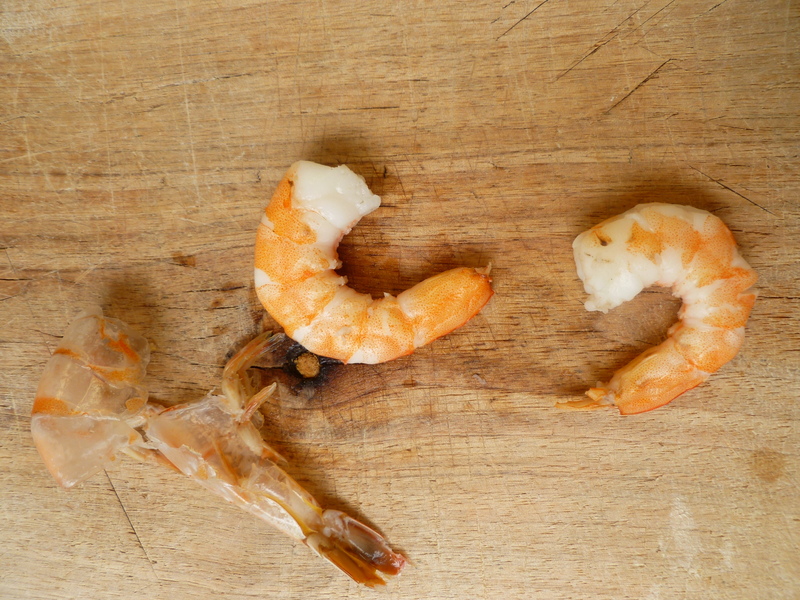 For anyone new to cleaning shrimp, here is an explanation of how to do it: First, take up a shrimp, holding it legs-up between your thumbs and forefingers. 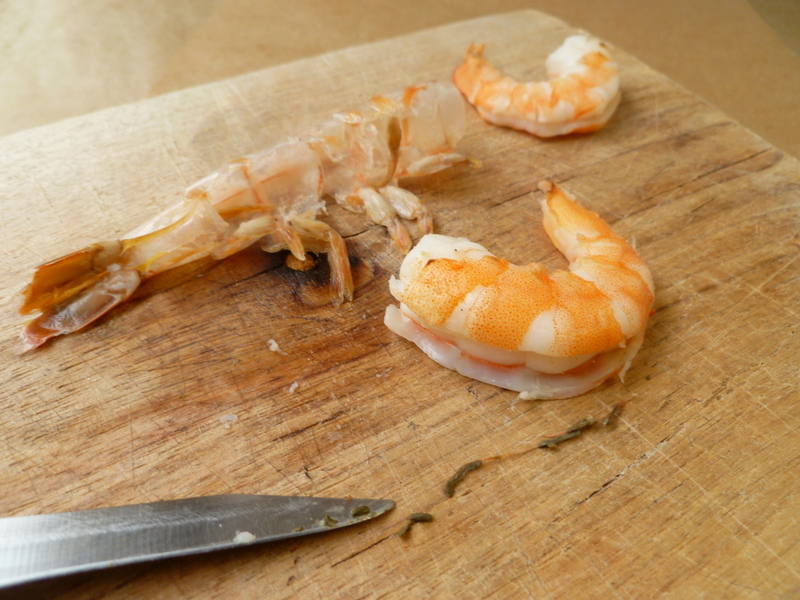 Pull apart back the shell and slide it back over the shrimp’s curved back …. 2. 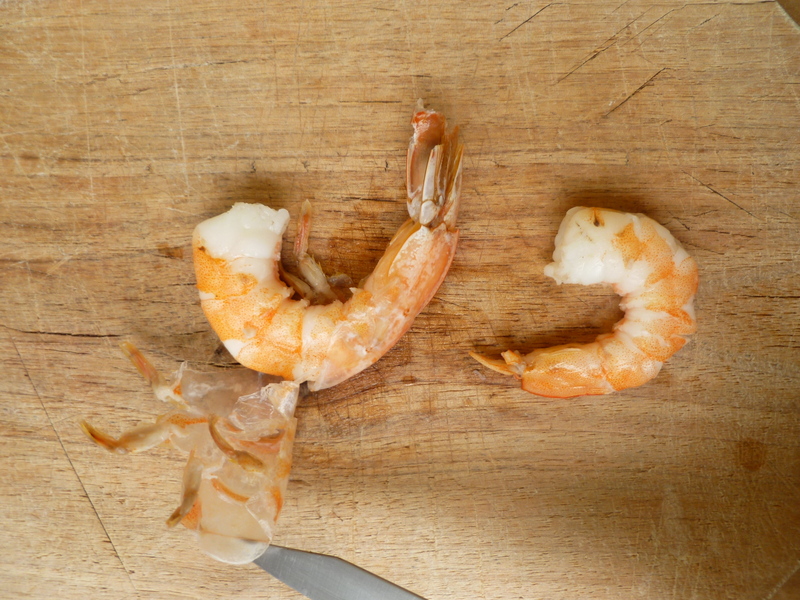 Reserve 1 or 2 shrimp to garnish the ramekins of pâté. 3. 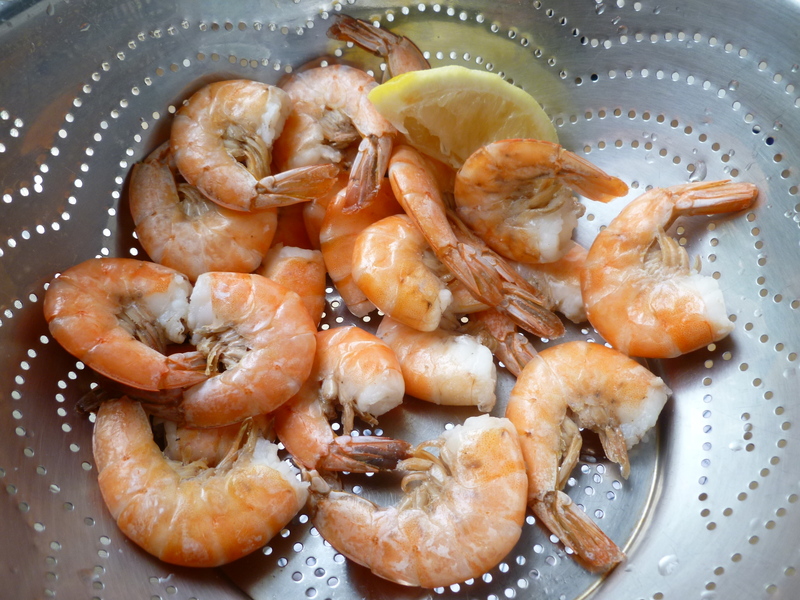 Put the shrimp, gin, lemon juice, Dijon mustard, mace, and cayenne in the food processor and pulse to chop the shrimp coarsely, leaving little bits of shrimp in the mixture. Transfer the mixture to a mixing bowl and beat in the butter and a few grinds of fresh black pepper and salt with a wooden spoon. 4. 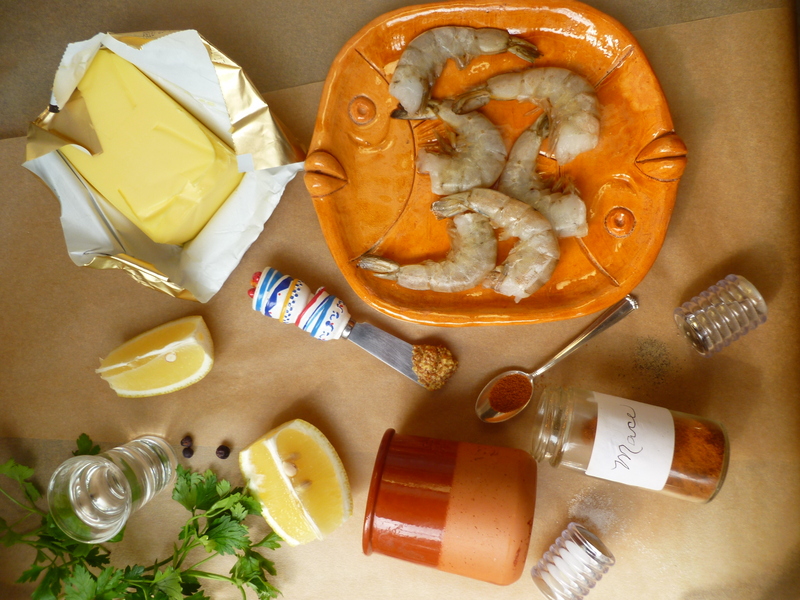 Put the pâté in ramekins or small crocks and chill it for a least 2 hours or overnight. 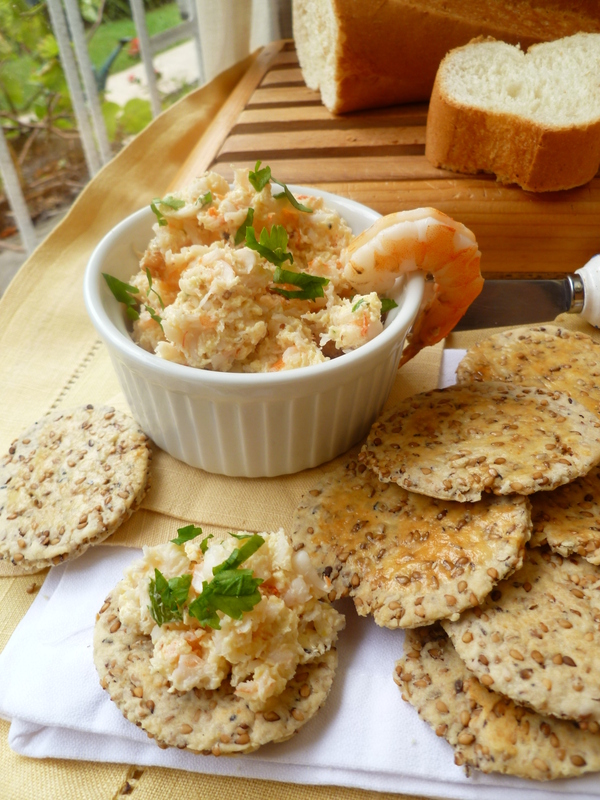 A Second Note: Shrimp Pâté with Gin is an hors d’oeuvre in the Dinner Menu: A Lowcountry Dinner, along with Benne (Sesame) Seed Cocktail Crackers and ‘Plantation Eggplant’ Pizza Chips with Capers. 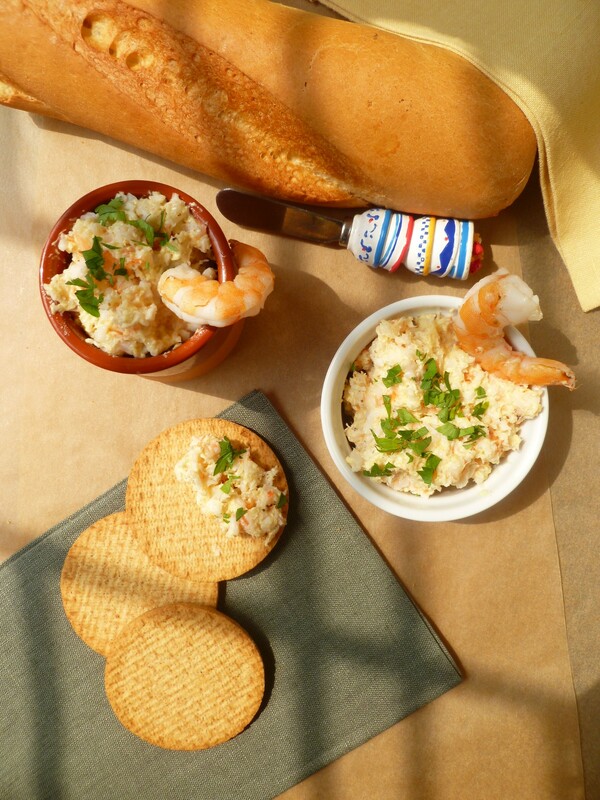 The pâté is adapted from a recipe in James Villas’ The Town & Country Cookbook (1985). 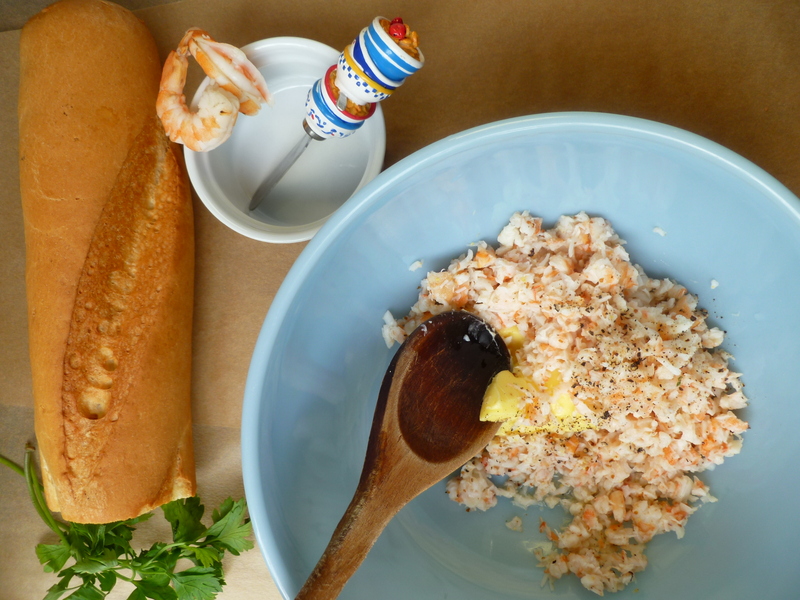 A Final Note: The complete text of Célestine Eustis’ Cooking In Old Créole Days may be read online here at ‘Feeding America: the historical American cookbook project. A brief biography of Miss Eustis is available at ‘Onfoodandhistory.com‘.